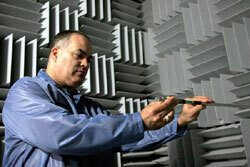 HomeAll articlesAcoustic propertiesAsk the Acoustics Experts Program Launched by PCB Piezotronics, Inc. Ask the Acoustics Experts Program Launched by PCB Piezotronics, Inc.
PCB Piezotronics, Inc. announces the launch of the 'Ask the Acoustic Experts' program. This program connects people with acoustic measurement questions to PCB's worldwide team of technical experts. 'Ask the Acoustic Experts' is designed to assist both those who are new to acoustics as well as seasoned acoustic engineers. Questions can range from how to select the correct acoustic sensor to details and specifications on PCB's innovative products. "We have a diverse and experienced team of acoustic resources to draw upon for answering questions," says Mark Valentino, Acoustics Product Manager at PCB®. "The team includes people with experience in the Test, Automotive, Aerospace & Defense, Energy and Government sectors, and engineers that are on the ASA and IEC standards committees." 'Ask the Acoustic Experts' is a web-based interface (www.pcb.com/acoustic-experts) that features a profile on each of our experts and a question submission form. PCB's team of engineers and scientists who design, test, manufacture, and support the acoustic products will respond to your questions. This program is the latest addition to PCB's customer educational resources which include videos, FAQs, white papers, and 3rd party reports. PCB also provides Acoustic "Lunch-and-Learn" seminars and sponsors full day training seminars with acoustic expert, Dr. Andrew Barnard from Michigan Technological University. For more information, contact Mark Valentino, Product Manager, at (866) 816-8892 or questions may be emailed to acoustic-experts@pcb.com.